This is a comedy play for all the family which tells the story of Baptiste, an elderly farmer with four daughters still living at home who he is desperate to be rid of. He is visited by an Angel who tells him that if he can get the youngest daughter Josie married, it will give him a chance to be rid of the others. Never one to miss a bargain, Baptiste does as he is told and buys his daughter a weave (hair extensions) of many colours. The production is inspired by an eclectic mix of musicals including Aladdin, Joseph, Cinderella and Sleeping Beauty and features an ensemble of some of the UK’s best comedy actors. 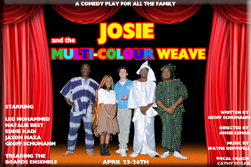 Josie and the Multi-Coloured Weave is written by award winning comedian and broadcaster Geoff Schumann (Choice FM, BBC London and Waiting to Exhale, Theatre Royal Stratford East). Writer and performer Angie Le Mar directs this piece hot on the heels of her successes at the Hackney Empire with The Brothers and Forty. The play stars Leo Mohammed (The Real McCoy and winner of the Best Stand Up, Hackney Empire in 2000), Eddie Kadi whose one man show sold out at the 02 Arena, Jason Maza (Mad Blud, Theatre Royal Stratford East) and Natalie Best (Hansel & Gretel Theatre Royal Stratford East).